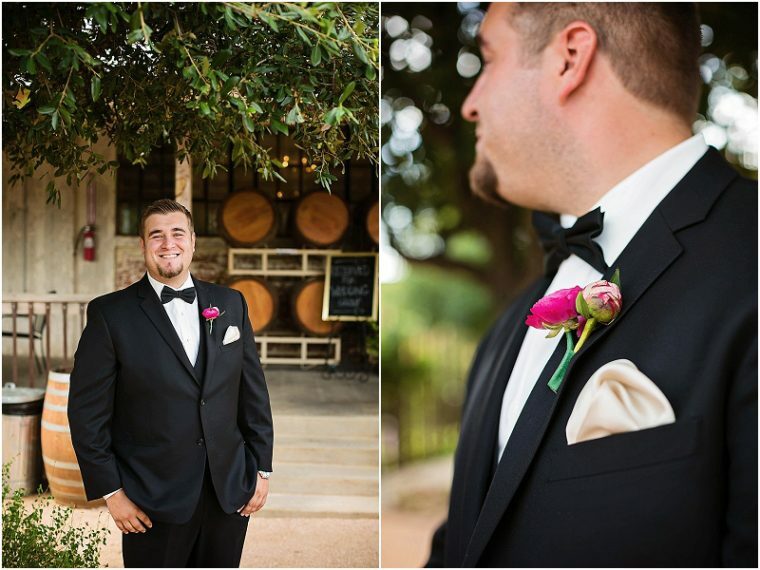 This vibrant Abilene wedding submitted by Swan Photography looks fun and fashionable. 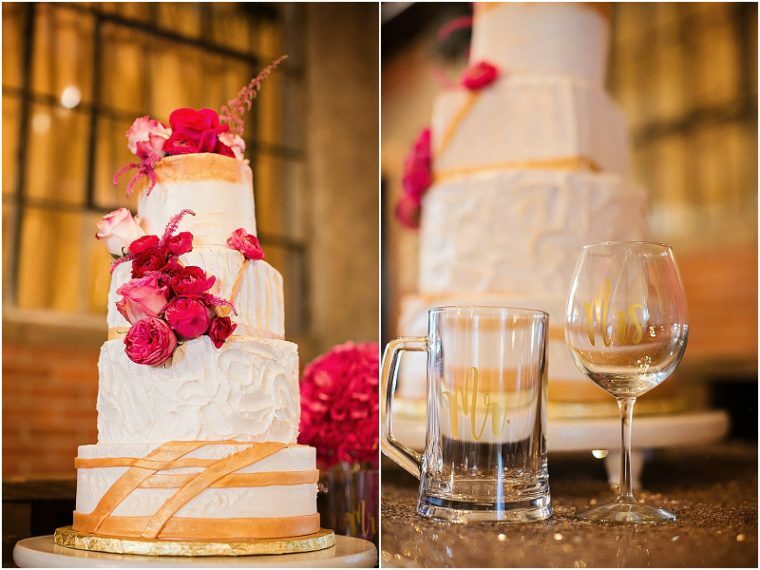 The bride chose a unique color scheme - deep pink and gold - for the wedding and they work extremely well together. 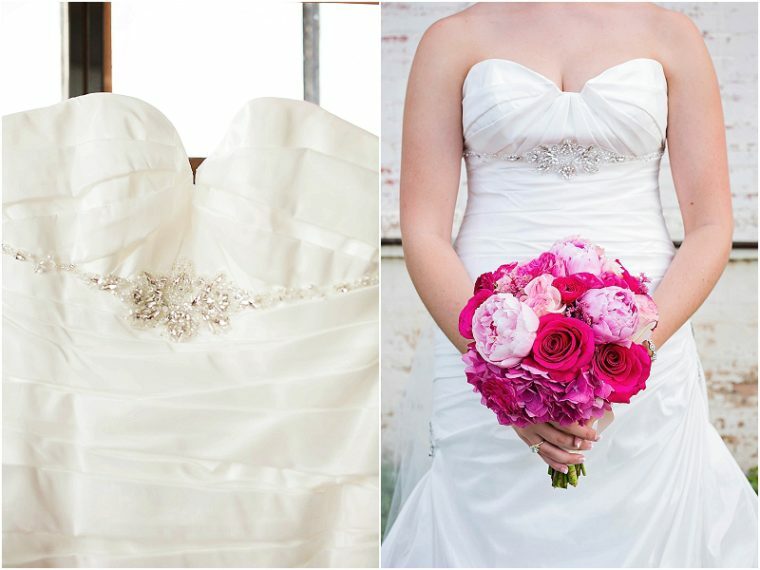 The bride's bouquet with several shades of pink looks amazing, as does the pink lighting used in the reception. 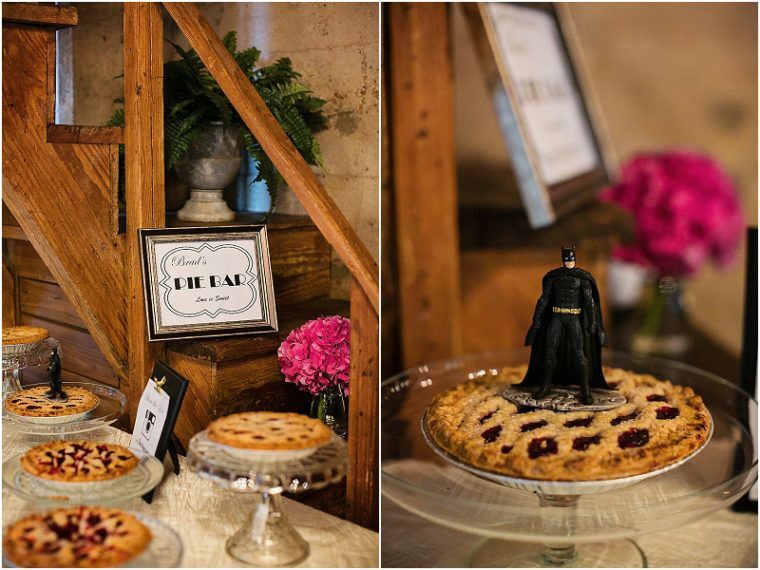 I love the choice to use wine bottles as part of the overall decor and the inclusion of a pie bar in the dessert area in addition to a more traditional wedding cake. 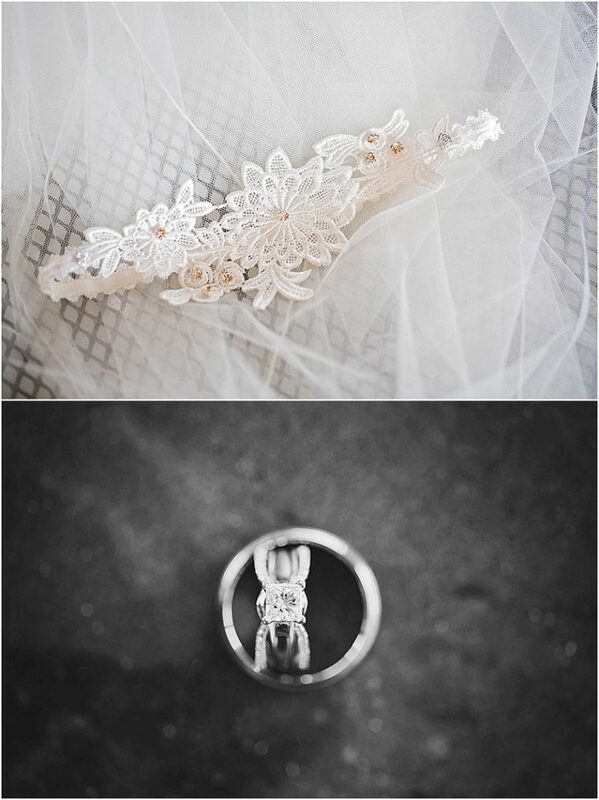 You can find more photos from this wedding in the gallery. 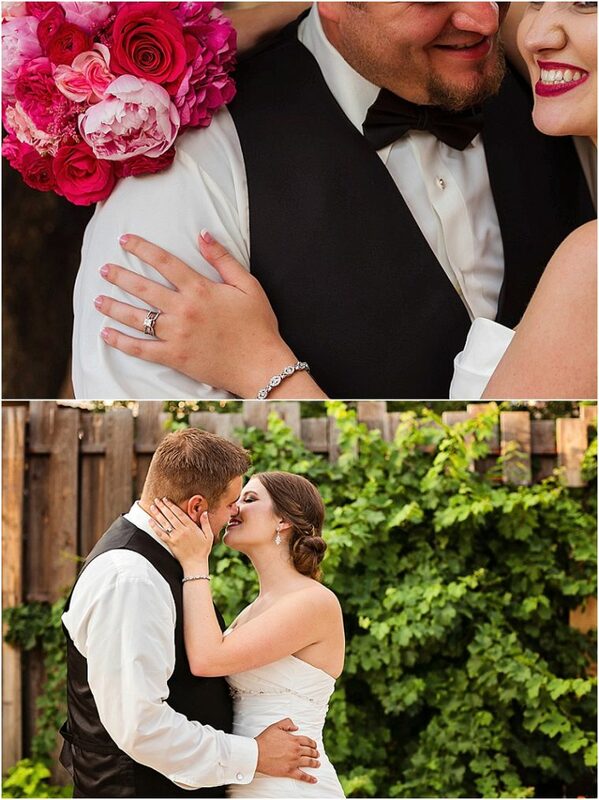 From the Bride...My husband and I met as well as live in Wichita Falls, but I am from Abilene so we weren't sure which place we wanted to get married. 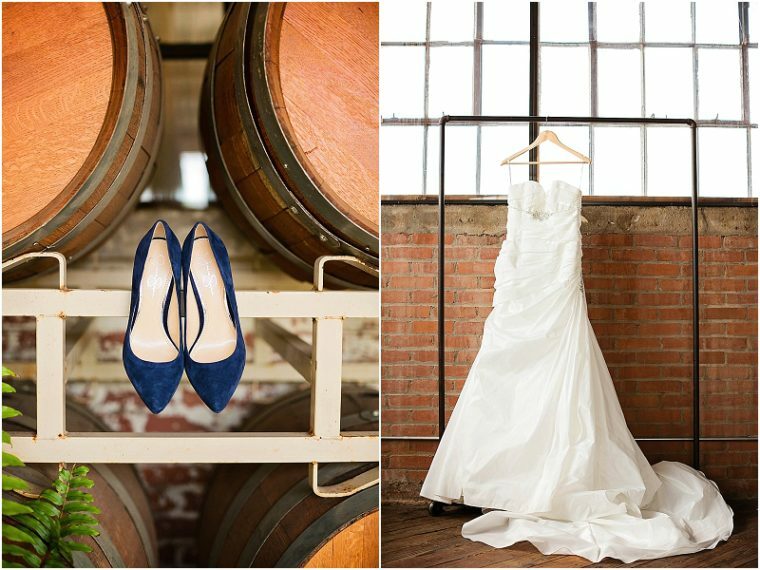 We had wanted somewhat of an industrial feel with exposed brick walls, open ceiling, but natural lighting was important to me especially. 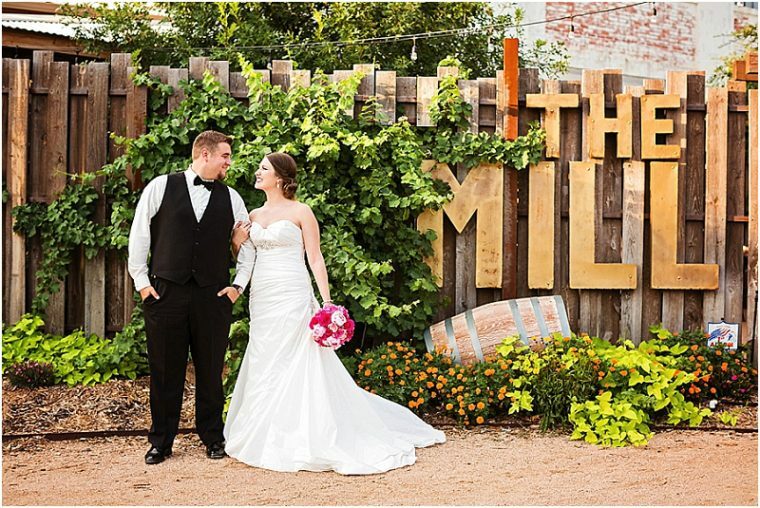 Then we found The Mill in Abilene, fell in love with it, and the place was decided! 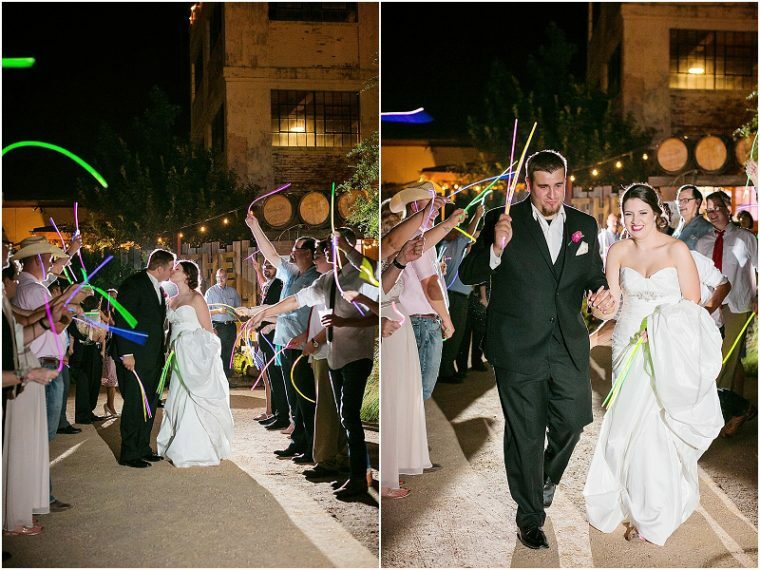 It was going to be a summer wedding, and I wanted to have fun, lively colors yet still sophisticated. Loved the look of the dark pinks with gold/metallic accents. I didn't want my bridesmaids to be "matchy matchy," so I let them pick their own dresses in whatever style that they wanted as long as they were long and within the gold/champagne color scheme and I think it turned out great! 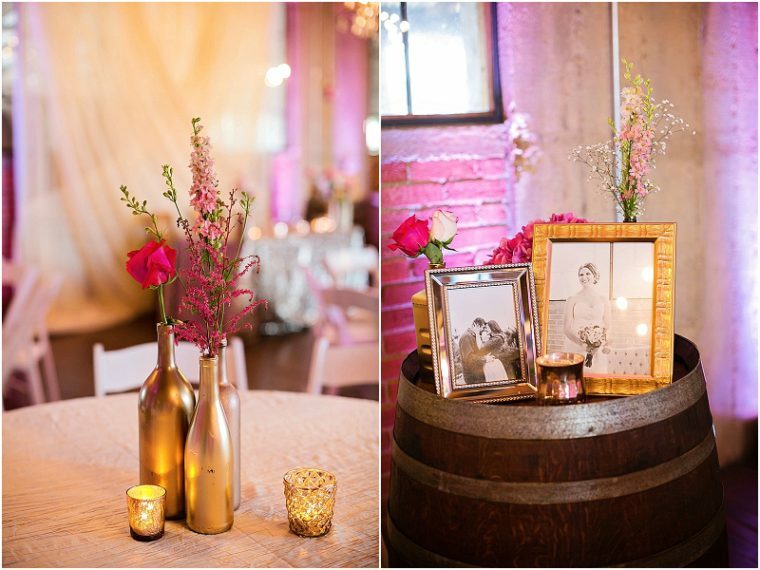 The Mill is also a winery so we decided to incorporate wine bottles into the decor by spray painting them in different shades of gold and using them along the aisle during the ceremony and then doubling as table centerpieces for the reception. 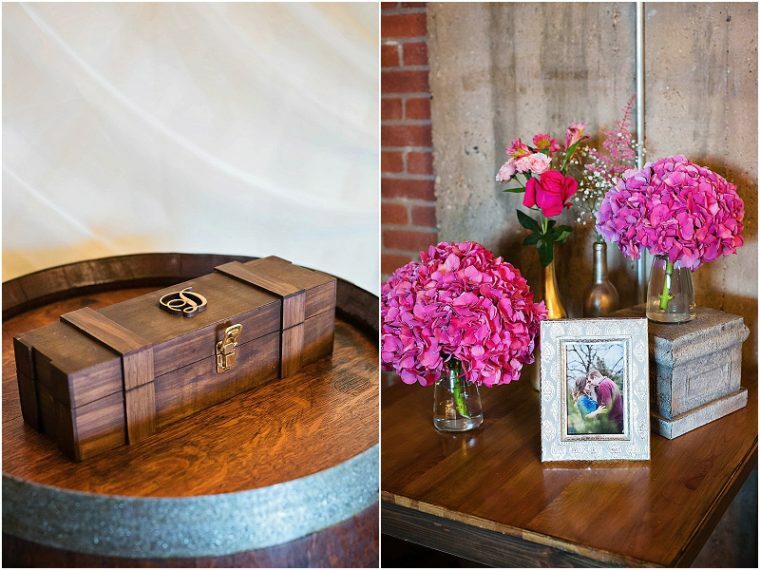 We also had a wine box for the ceremony and my husband made/stained the box! None of this would have been possible without Laura Mayfield and Mayfield Events! She helped plan everything from the beginning and was also our Day of Coordinator. 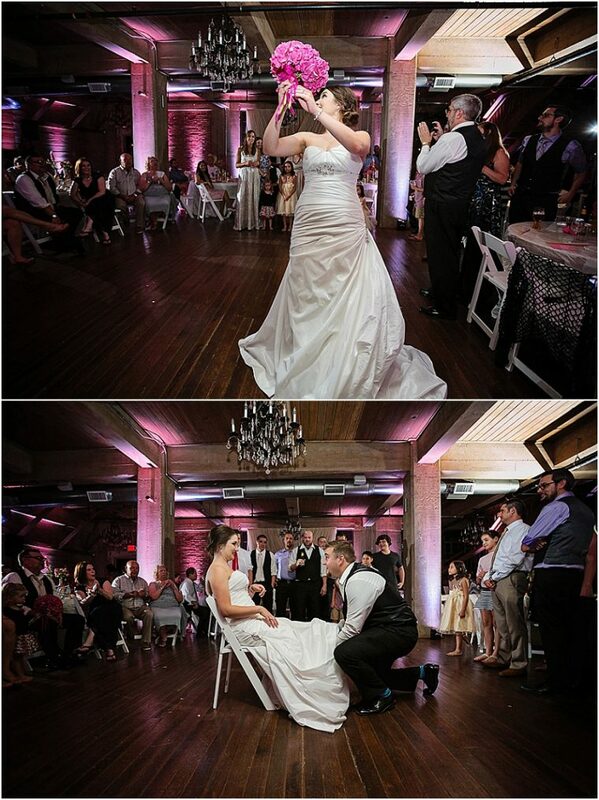 The day of our wedding went so smoothly and truly was the best day ever! They did the draping that was behind us during the ceremony and it was so beautiful! 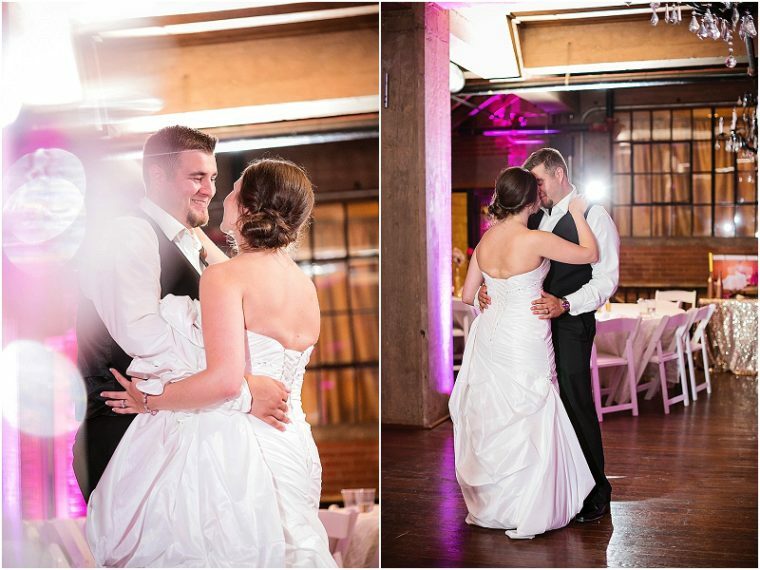 The uplighting was a nice touch and made for a great ambiance. They completely reinvented an already amazing venue and turned it into something even more incredible! It was more than I could have ever imagined. 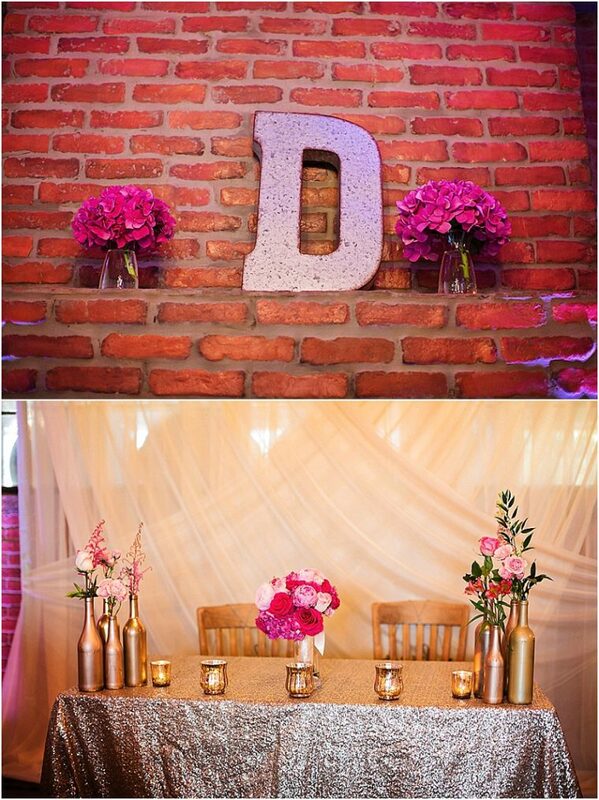 I loved our venue pretty much just the way it was so I didn't want too much decor to take away from the space. They added flowers to the wine bottles and we had mercury votives/candles around, but that was about it! My father-in-law had big, metal letters of our initials made that we hung in the big windows. 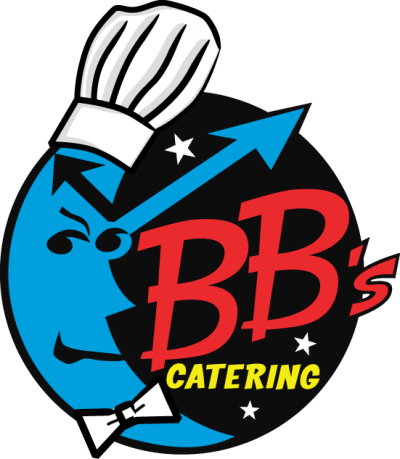 Neither of us wanted a formal, sit down meal, so we went with pizza from Stone Oven, one of our favorite pizza places in Wichita Falls, and it seemed like a big hit with our guests! I was inspired by a picture on Pinterest for my cake and Michele Kilborn of Cakes by Birdie made it a reality! She collaborated with the florist and surpassed expectations by adding some florals to it and it was even prettier than I had imagined! My husband isn't a big fan of cake, so he had pie instead! They were displayed on crystal cake stands that had been borrowed from several friends and family members. Batman is his absolute favorite, so we incorporated that as well as a little surprise for him and he loved it! 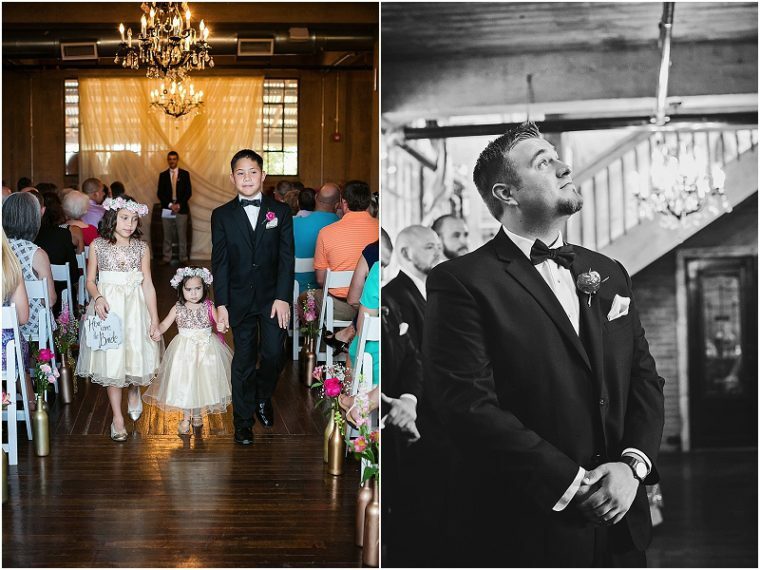 Beth with Swan Photography captured our special day for us and did such a great job! So lucky to have found her, thanks to Laura Mayfield, and to have these memories to look back on for the years to come!"